This is the Animation Store Manager!! Anime Tenchou is a CM character for Animate, one of Japan's biggest retailer of anime, games, and manga. 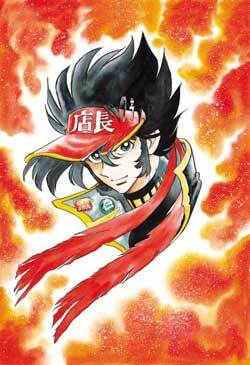 The character series was created by Shimamoto Kazuhiko for publicity purposes. Later adapted into a manga, a weekly radio drama and this OVA animated by GAINAX and directed by Anno Hideaki. Anizawa Meito is the blazing store manager. He is a fireball who loves animation merchandise at heart. He takes over the dying wish of the former store manager, though still alive, who was attacked by the rival store and becomes a ?store manager? of newly opened animation goods specialty store, Animate. The scarlet, ?store manager visor? is his trademark.